For some reason, I get frustrated really easily on the internet when I come across something that doesn't work intuitively. It seems that the majority of people are desensitised to the various hurdles of thought on both the internet and computers in general (e.g. pressing "Start" in windows to get to the "Shut Down" option) yet more and more I find myself getting annoyed that people can't get the most basic things right on the internet. Now that I'm working as a web consultant, I'm hoping to be able to get a lot of clients to just look at the systems and sites they have created and apply a bit more common sense to them in the way popularised by the excellent "Don't Make Me Think" by Steve Krug. This is a view extended by Joshua Porter's "Designing for the Social Web" (which I shall be reviewing here shortly) although that is geared slightly more towards customer service and social networks than the all encompassing issue of usability and best practice. 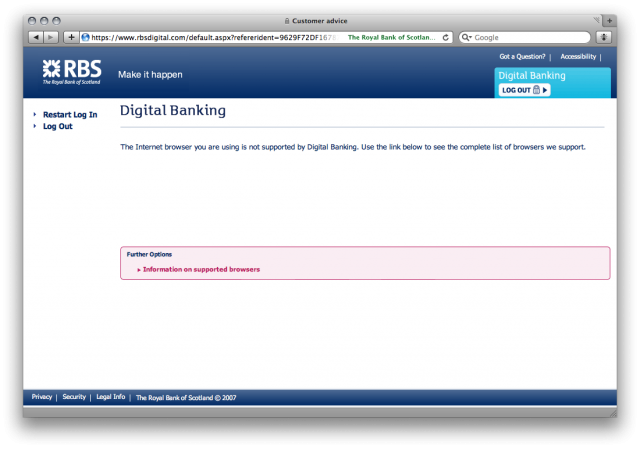 So, for my first real post on my new website I thought I'd perform a basic usability study of the online banking system from the Royal Bank of Scotland; a website that frustrates me every time I want to check my bank balance online. To be fair, the unsupported browser thing isn't a problem for me as Safari 4 has a very useful 'Develop' menu in the toolbar that lets me choose a different user-agent so I can pretend it's Safari 3.2.1 (which I'll do shortly to let me into the banking). What does annoy me is that there is no reason for them to detect your browser as the site isn't any different depending on your browser. At the very least, if the browser isn't supported (for some sort of CSS hacking rules perhaps?) it should load up a plain text version rather than just lock you out completely. It really adds insult to injury seeing as by changing the user-agent, the site works absolutely fine. Now I'm not suggesting that they should be updating their site every time a new browser comes out to avoid this message. On the contrary, I'm suggesting that they should completely abolish the specific browser sniffing and just detect browsers (by functionality rather than name) which definitely don't work (e.g. IE 5.5 or Netscape 4) and offer them a textual fallback. Other usability problems with this page include a "Log Out" button when you haven't logged in yet, and a "Restart Log In" button which just reloads the page. On the plus side, they do have a link to "Information on supported browsers" but this rapidly turns to a negative as there is absolutely no information there at all on supported browsers - the problem isn't even acknowledged! At the very least there should be a list of supported browsers with links so you can upgrade, etc, but to have a link which goes to no meaningful information is just ridiculous. Anyway, if we happen to be using a supported browser (or if we spoof our user-agent as I have to do), then we'll move on to the next page; the first stage of actually logging in. Now this page in itself isn't too bad. Yes you have to enter a 10 digit number decided by the bank rather than an email address or an easy-to-remember username and it's only one field when it could in fact have been added to the previous page (e.g. enter number and then begin log in as HSBC does it) but compared to the other pages it's fairly acceptable. The only thing I would change is minimising the amount of text and enlarging the 'Next' button - it doesn't need to be small and hidden away at the bottom of the page! We now come on to my favourite page; security clearance. For me, this page is where all notion of web standards, accessibility, and best practice fall apart. Before I begin, I would like to say that I understand fully the need to break up a security number and only enter certain digits for authorisation - it's obviously to stop anything like keyloggers or people watching you type as they'll only get a portion of the password and the next time you come to login you'll be asked to enter a different part. I don't have a problem with that. I do, however, have a problem with being asked to enter parts of my password in a completely random order. Is there any particular reason why I have to enter 1st digit, 4th digit, then 2nd digit? It makes every attempt a brain-teaser in itself as I have to conciously remember the security code, count up the number of digits, and then do it twice more to work out the order. More often than not I'll be saying it under my breath in order to keep it in my fairly poor short-term memory so anybody near me would get the code anyway! So, if you managed to decipher your password, enter it correctly first time, and scrolled down and squinted to find the next button, you will move to your welcome screen where you can get the basic overview of your accounts, right? Wrong! This page has been designed for the sole purpose of getting people to keep their information up to date as well as advertising new products / services. There is absolutely no benefit to the user as far as I can tell. If we look at the first part, it tells the user when they last logged in, part of their address, and their email address. Knowing when you last logged in might be useful as that way you can see if someone else has logged in than wasn't you - however, in reality most people don't remember exactly when they last logged in and I would assume that the vast majority of people don't even read that sentence. The address section is completely redundant as it only shows a small section and again people are unlikely to read it. If you move house, you are quite obviously going to change your bank details and I don't think a reminder every time you log in to your internet banking is necessary. 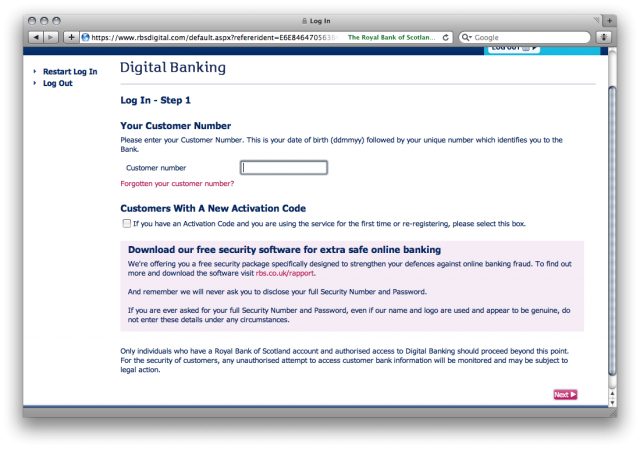 The final section about your email address is again redundant as the bank never emails it's customers. Why? There are too many phishing attacks in this day and age so the majority of emails from banks look like spam! Besides, what are they going to email you? Probably just adverts for other services such as advanced bank accounts and mortgages. Everything below-the-fold (including the next button again!) is just advertising space. 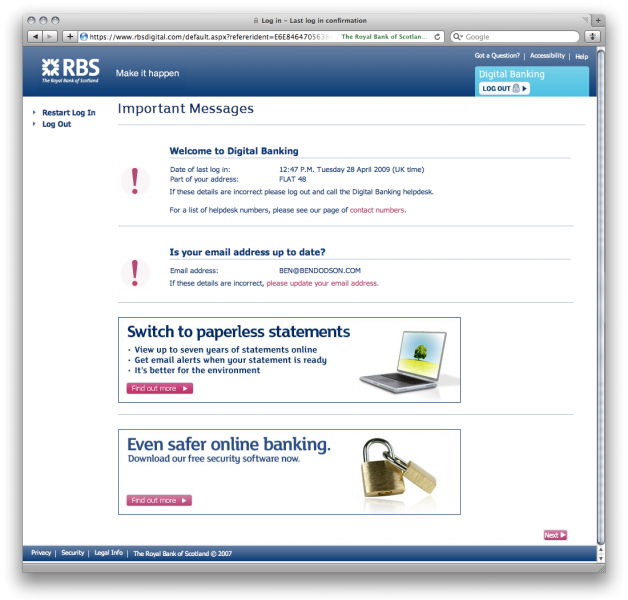 In this screenshot, they are advertising paperless billing (which you probably already know about if you're using online banking) and the misleading "Even safer online banking" which is advertising for it's free security suite which basically tells you that you're connected to the banks website and not another website. It only works on 32-bit windows running either IE or Firefox and won't work with screen readers. Whilst this 'advertising' is inevitable, it does not need to be shown every time the user logs in especially not on the confirmation of login page! It's also ironic that they choose to advertise their free software to make you more secure after you've logged in rather than at the start of the journey (where they do mention it but in much smaller writing rather than the large banner ad they use here). 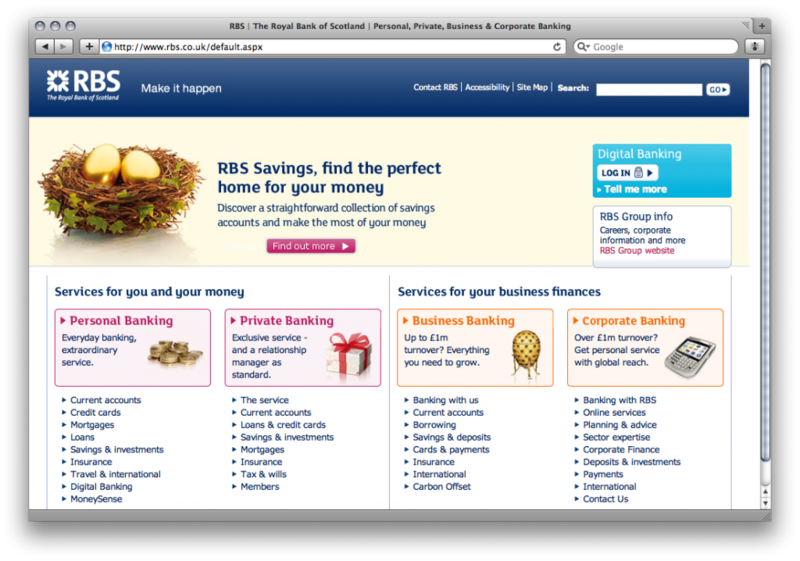 There are several basic steps that RBS can take to rectify the process of logging onto their online banking system. Firstly, they need to remove the browser sniffing and instead take up the practice of graceful degradation, that is to say show the best way of doing it and then fall back to more simple methods if the browser is too old. There is no good reason why the latest browsers (which are by virtue more secure) should not be allowed access to the site. Finally, the entire process can be minimised down to 2 pages. 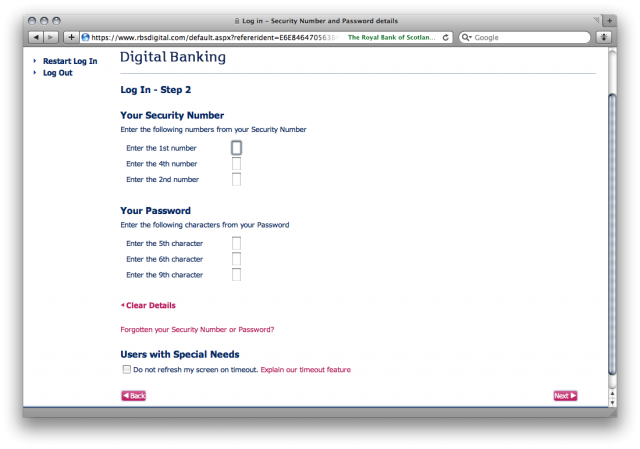 This is done by adding the 'customer number' input next to the initial 'Log In' box on the RBS homepage, and then having a single page to have both the two security checks (no random ordering of input boxes please!) and details of their antivirus package. Once you've passed security, you should be taken to the overview page where you can then at the top of the page have a small section about when you last logged in and then use sidebars for advertising of services such as 'paperless billing' or reminding customers to keep their address details up to date. With these three simple steps, the headaches for all customers can be removed, and the process would become easy-to-use rather than a constant struggle! I'd be interested to know of anyone's views on accessibility and usability with regards to online banking systems - please use the comments box below or contact me. You can also let me know if there are any particular sites that have glaring usability issues that you'd like me to investigate in the future. London Underground Tube Updates API is live! I posted an article just over a year ago about an RSS feed of the London Underground Tube Status that I'd created by scraping the TFL website. I was overwhelmed not only by the response via comments and emails, but also by the sheer number of people using it (my apache access logs increased by 7GB per month!) that I decided to make a full blown API so that it would be easier for developers like me to create great mashups using data that should always have been publicly accessible. I'm happy to announce that after a good test run at the Rewired State event a couple of weeks ago, the Tube Updates API is now live and ready to be used at tubeupdates.com/ - You can request updates from any line (including the Docklands Light Railway) in either JSON or XML format and everything is structured to give you as much information as possible e.g. station closures, why there are 'minor delays', etc. But that's not all! I am caching the data (and have been since 1st Jan 2009) so you can also go back in time and look at the underground system at any point in time! I wrote a rather rudimentary stats analyser for my Rewired State project which shows you the basic reliability over the past couple of months but that is just a taster of what you can do with the information now available. I'll be releasing new versions of the RSS feed shortly so that non-developer types can still access the data - I'll be announcing those on this blog and on my twitter feed once they are ready in the next few days. In the mean time, please play around with the API. There are no real usage terms but I'd love to know how you are using it so please get in touch if you make use of it! For those that come to this site regularly, you may have noticed that it's undergone a major overhaul! I've done a complete redesign (looks best in Safari) and replaced the blog engine with Wordpress so I should be blogging a lot more frequently. I'm also about to become a full time freelance PHP developer and web consultant but I'll be posting more details about that soon!! iPhone 2.1 Firmware Update Released - Fast? Stable? Fixed? So the firmware that all iPhone users have been waiting for has finally arrived. Even before it's announcement at Apple's "Let's Rock" event, speculation was rife about what would be included. Many people wanted new features such as copy & paste and MMS support (it's never going to happen!) whereas others be-cried the fact that their beloved iPhone just didn't work that well due to app crashes, slow typing, and painfully long backups. However, Steve Jobs finally announced that firmware 2.1 would be with us on Friday 12th September and would be a bug-fix only release. He claimed that the phone would be faster, backup time would be "dramatically reduced", would have a "decrease in call set-up failures and call drops", "faster installation of 3rd party applications", would fix a lot of app crashing bugs, and would have "improved performance in text messaging". There are 2 new features as far as I can see which are Genius playlist creation which came with iTunes 8 and a secure wipe of the phone in the event that the keypad lock is entered incorrectly too many times. I regularly install and uninstall apps on to my iPhone as I love trying out the latest new things to come along. However, in the past it would take an absolute age to install anything on the phone - in fact I gave up doing it via the App Store on the iPhone itself as that usually didn't work (or would take an hour or so by which point the battery was dead) and so had resorted to sideloading apps via iTunes. This still could take a good 10 minutes or so though which wasn't really acceptable. Once the apps were on, they would frequently crash or hang - several times I had to do a hard reset of the phone (hold the home button and power button down together for about 10 seconds). Amusingly, I only learnt about the hard reset after the 3rd time my iPhone crashed (screen wouldn't come on) and I thought the only way to fix it was to do a restore via iTunes. Anyway, this is all water under the bridge now as I managed to get 26 applications installed via iTunes in less than 5 minutes and have installed several apps via the App Store on the iPhone itself in a couple of minutes. A vast improvement! Additionally, I haven't had a single app crash on me yet which is also much improved on previous performance. Apps seem to be quitting correctly and quickly as well. For instance, in the past if I closed down "Tap Tap Revenge" by pressing the home button, the app would disappear and the home screen would appear but the music would keep playing for another 5-10 seconds or so. Now it just quits as it should have done in the first place. I hadn't seen it reported widely but my location service was incredibly patchy. If I was in my house or at work, then pressing the "locate me" button would just lead to a little blue spinning circle which would never find me. I put this down to the iPhone 3G saying "I've got GPS - Use it even though it'll never work in this building" - there appeared to be no fallback to cell tower triangulation. This is fixed now though as within 2 seconds of pressing the button in my living room, I had been located to within 50m or so. GPS also seems to be a little faster outside but again it does a cell tower triangulation instantly before it even bothers with the GPS locater. Now it just needs a decent turn-by-turn GPS app to make it really good - I managed to fake this the other day whilst I was lost in Manchester by loading up Google Maps and making it do directions from my current location to my destination. This all showed up fine and then I literally scrolled across the map as the little GPS dot moved. This worked absolutely fine but I couldn't help but think it would have worked a whole lot better if when the blue dot got near the edge of the screen then the map scrolled automatically! By far the most annoying bug was that after a little bit of use, going to type an SMS message became painfully slow. The keyboard just had a huge amount of lag for no reason! I eventually found a fix for this which was to quit the SMS app, then open it again and delete a character - it would then go back to full speed. No need for this now though as I've had no laggy text messages in the last few days! Now my backups are back up and running and are incredibly fast so I'll be leaving it on for the time being (although hopefully there won't be a need for a restore). On a separate note, I'm again not sure if this is an iPhone 2.1 update or an iTunes 8 update but when you are looking at your iPhone through iTunes, it actually shows how much space is used up by Apps rather than sticking them under the category of Other. Very helpful! Talking about doing backups leads me nicely into a new feature of iPhone 2.1 - the ability to have your iPhone wipe itself if someone enters in the passcode incorrectly more than 10 times. This in response to the controversy surrounding Apple when it turned out that you could bypass the passcode if you had a certain setting enabled. Now most people commented that no-one used the passcode and I agreed with them as I had never had it enabled before. However, now there is a secure wipe option, I have put it back on so that if someone steals my phone I know my data is safe. If they enter the code in wrong more than 10 times then my iPhone will just wipe itself similar to the Exchange Remote Wipe feature. My only bug bear with the process is that 10 times is a long time. I'd like to be able to change that number to 3 - I'm not going to enter it in wrong that many times (and if I do then my fast backup process as detailed above means I can restore it fairly quickly). One commentator said they'd like it changed so it wipes if you get it wrong the first time making each unlock a little like an episode of 24! I haven't had much experience of this on my iPhone as I only have a small portion of my library loaded on to it, but it appears to work in the same way as genius within iTunes 8. The idea is that every time you sync, your library is sent up to the Apple Genius "cloud" where it is analysed and compared with other peoples libraries. it can then recommend you music in your library that goes with other music in your library leading to a nice playlist that blends together quite well. It's essentially the same as recommendations from last.fm but seems to work quite well. It should get better as more and more people use it as the cloud will have more data to analyse. The only improvement I can see to this (which is a long shot and won't ever happen) is if there was a way to get the tracks to mix into each other as you went between them in a playlist. I listen to a lot of dance music and it would be great if genius was clever enough to do a DJ style mix between them. There was an application on Dragons Den a few years ago that did that but I'm not sure what happened to it! So the new firmware is a vast improvement and offers a few little extras as well such as secure wipe and Genius playlists. The other thing I've noticed is that the icons for the different networks you are on (e.g. GPRS, Edge, 3G) have been changed slightly - Why I don't know but they do look a little clearer! If you don't have it already, then upgrade to both iPhone 2.1 and iTunes 8 - you'll be glad you did! I was recently cleaning through the "technology cupboard" in my flat (every geek has one - it's a place where all the useless electronics we've collected over the years live) when I came across an idea for creating a home entertainment system for my bedroom. The main driver for this was a forgotten Mac Mini (512MB of RAM and an old G4 processor) which I realised could hold all of my music on its 40GB hard drive and send it wirelessly to all of my other equipment. The problem I have is that at present I have 3 computers at home and 1 at work (plus my iPhone 3G) which all have a complete copy of all of my music files (around 20GB - obviously the iPhone doesn't have all of that as it doesn't fit but that's a separate issue) - the downside to this is that when I update one machine the others are then out of sync. My original plan was to have the mac mini hold everything and then the other computers would use it's hard drive over my network as the master copy. That way if I added music to the mac mini, the others would all be in sync. I have since completely given up on this idea as I needed to a) access music on my laptop all the time and b) access music on my work iMac without having to leave everything on at home and broadcast through a static IP (which would also have been a little slow especially when I skip through lots of tracks - I'm very picky at what I listen to). However, since I started writing this article there have been rumours flying around about the 9th September "Lets Rock" event being staged by Apple. Several sources are touting that iTunes 8 is going to be released and will have an option to stream your music wirelessly to other machines (or an iPhone) through the internet. Let's hope this is true! With the initial problem left alone for now, I decided to think on another problem I have. If I want to listen to music in my bedroom, then I have to bring my laptop in and listen to it from there. This isn't a huge difficulty but the sound quality isn't great and I don't like using my laptop in my bedroom (mainly because I try to keep some separation between work / computer based activities from other things I enjoy like reading and writing - the ideal separation is a physical one so I don't use my computer in my bedroom at all). I could buy a cheap hi-fi system but then it wouldn't be connected to my iTunes library. Alternatively I could get an iPhone dock but they are quite expensive (due to the magnetic shielding) and also I can't fit all my music on there so it wasn't really an option. At this point I'd like to point out that yes I could have used AirTunes (plugging a hi-fi unit into the 3mm audio jack on an Airport Express in order to pick up a shared iTunes library) but that would require me leaving the laptop on in the other room. Not a great hardship but I'd have to get out of bed to turn it off (which would be a hardship). After a bit of thought and a look at the components I had, I worked out that I could put the mac mini under my bed with a wireless card and some speakers and then play music through it using the Apple Remote application available from the App Store for iPhone. I could also install a VNC client so that I could control the mac mini remotely if necessary (in the case of copying music onto it, installing updates, etc). Perfect. I'm quite pedantic however and so the above solution wasn't yet 100% perfect. The main problem I had was that the mac mini would need to be on 24 hours a day when I'd only be using it for around an hour a day at most. This doesn't bother me from an environmental perspective (I'm not into "green") but did bother me from the point of view that I'd be paying for electricity I wasn't using (around 45-50W an hour I believe which would be around 16p a day - that works out at nearly £60 a year for nothing!) and that the components would be wearing down from overuse. It would probably become a little unstable as well and I'd worry it would burst into flames or something! So, the mac mini needed to be put to sleep and needed to be woken up. I could do this by pressing the power button but it's under my bed and I can't be bothered with the movement involved. Thus a solution had to be created that would let me wake it and put it to sleep remotely with my iPhone being the obvious candidate for this as it was already choosing the songs being played. You can try the above in Terminal and watch in awe as your mac succumbs to tiredness. So this is all well and good but can only be run on the machine which you want to put to sleep; it can't be done remotely. A solution to the problem comes in the form of the Apache2 web server that comes installed by default on all OS X Leopard installations. If I could set the mac mini up as a server, knock up a bit of PHP to pass the sleep command directly to the machine, and then broadcast the IP so that the command could be run via Safari on the iPhone, then I would be on to a winner! This is exactly what I ended up doing and the instructions are below for your delectation. First of all we need to activate the Apache2 web server in Leopard. To do this, go to "System Preferences" and then to the "Sharing" icon. If you tick the "Web Sharing" checkbox, then the server will come to life and will be enabled whenever you start the machine. You can check this has worked by going to http://localhost/ on the machine and checking you get an apache default installation message. Now this is done, we need to set our Computer Name for easy access to this page from anywhere on our home network. The setting for this is also in the "Sharing" control panel and so I set mine to mini. This allows the web server to be reached by any computer on the network by going to http://mini.local/ - try it yourself by changing it to whatever name you want (the URL to access your computer will be shown on the same screen). Now that we can connect to the web server, we need to get PHP up and running and write our script. PHP 5 doesn't come enabled by default so we have to do this by opening up terminal and typing the code below. I am assuming at this point that you have the excellent TextMate installed which is accessed from the 'mate' command in Terminal. If you don't have it, either install it or substitute 'mate' for some other text editor command like 'pico' or 'vi'. You can use 'restart' in place of 'graceful' to do a full restart, but a graceful restart won't kick off anyone that is currently using your server. This isn't going to matter here but it's a good habit to get into in case you ever need to restart an apache server in the future. Yours will differ (unless you're called ben) but you can find out what yours is by going to your home folder - the name of the folder is the name of your user. Now restart the apache server (remember our graceful command from earlier?) and try out your site. You should find that your mac goes fast to sleep. Success! Simply go to the URL with safari on your iPhone, tap the '+' icon, and then choose "save to home screen" in order to set it up as a web app. If you want a fancy icon, then stick a square PNG named "apple-touch-icon.png" in the same folder as the index.php file and you'll notice that it appears on your home screen when you bookmark the page. Ok, you now have a sleeping mac that you want to wake up. Most computers have a little feature built in to them called Wake-on-LAN. The idea is that when the computer is asleep, the ethernet port is actually still active and listening for data. If a certain command is sent (referred to as a "magic packet") then the ethernet card will tell the rest of the computer to wake up. This is exactly what we need but unfortunately will not work over a wireless connection (as a wireless card doesn't stay awake when the computer is asleep). If you have connected your mac to an ethernet connection then you can ignore the next few steps, but for me a long cable wasn't really an option. I therefore came across a solution that would allow me to pretend I was on ethernet; wireless bridging. The idea behind wireless bridging is fairly simple. Rather than having an ethernet cable from your router to your computer, you instead have 2 wireless routers that are connected via ethernet to each machine (or modem) which then act like an ethernet link between the two. Now I already had an Airport Extreme which was broadcasting my network / internet wirelessly and so all I needed was another router on the other end. After a bit of headscratching with a BT router that was lying around, I decided the best way to proceed was to pop to the Apple Store and buy an Airport Express. The Airport Express is plugged into a standard power socket and then broadcasts a wireless signal. On it's base it has 3 inputs; ethernet, USB, and 3mm Audio. Usually the Airport Express is connected to a wired modem via ethernet so it can quickly and easily broadcast internet to the rest of your house however you can also plug in a printer to share that to wireless devices or plug in a standard hi-fi unit in order to utilise the AirTunes feature I mentioned earlier. I instead used it's network bridging service in order to connect it to the mac mini via ethernet and then extend the wireless network created by my Airport Extreme. This is fairly easy to do from the Airport Utility - I won't go into the exact process here as it is mimicked in several other places, but the end result that the Airport Express connects to the wireless network created by the Airport Extreme and sends this to the mac mini via ethernet. This means that we can now send a Wake-on-LAN command as both the Airport Extreme and Airport Express are "always on" allowing the packet to go through the bridge, down the ethernet cable, and straight into the ethernet port. Simple! Now we just need to find a way to send the magic packet from the iPhone. The application iWOL allows us to do this easily and has a very quick setup. Simply type in a name to reference the machine and the MAC address of the ethernet card (this can be found by going to "System Preferences"->"Network" and selecting your ethernet card. Now click on "advanced" and then on the "Ethernet" tab. Your MAC Address is the "Ethernet ID"). Now enable "LAN Broadcast" mode and you should be good to go. Once your computer is asleep, open up iWol and you should be able to wake it up at the press of a button. In order to control the mac mini better, I also installed a freeware VNC server called Vine Server that allows me to control the machine remotely. I won't go into the finer details of VNC setup as this has also been covered in detail elsewhere on the net. I will however mention the excellent VNC Lite app for iPhone which allows you to access VNC controlled machines. It's easy to use and very intuitive - it's also free! If you have any questions or comments, then please use the comments box below or contact me! I'm sending you this note because you registered a mobile device to work with Twitter over our UK number. I wanted to let you know that we are making some changes to the way SMS works on Twitter. There is some good news and some bad news. I'll start with the bad news. Beginning today, Twitter is no longer delivering outbound SMS over our UK number. If you enjoy receiving updates from Twitter via +44 762 480 1423, we are recommending that you explore some suggested alternatives. Note: You will still be able to UPDATE over our UK number. Before I go into more detail, here's a bit of good news: Twitter will be introducing several new, local SMS numbers in countries throughout Europe in the coming weeks and months. These new numbers will make Twittering more accessible for you if you've been using SMS to send long-distance updates from outside the UK. Mobile operators in most of the world charge users to send updates. When you send one message to Twitter and we send it to ten followers, you aren't charged ten times--that's because we've been footing the bill. When we launched our free SMS service to the world, we set the clock ticking. As the service grew in popularity, so too would the price. Our challenge during this window of time was to establish relationships with mobile operators around the world such that our SMS services could become sustainable from a cost perspective. We achieved this goal in Canada, India, and the United States. We can provide full incoming and outgoing SMS service without passing along operator fees in these countries. We took a risk hoping to bring more nations onboard and more mobile operators around to our way of thinking but we've arrived at a point where the responsible thing to do is slow our costs and take a different approach. Since you probably don't live in Canada, India, or the US, we recommend receiving your Twitter updates via one of the following methods. It pains us to take this measure. However, we need to avoid placing undue burden on our company and our service. Even with a limit of 250 messages received per week, it could cost Twitter about $1,000 per user, per year to send SMS outside of Canada, India, or the US. It makes more sense for us to establish fair billing arrangements with mobile operators than it does to pass these high fees on to our users. Twitter will continue to negotiate with mobile operators in Europe, Asia, China, and The Americas to forge relationships that benefit all our users. Our goal is to provide full, two-way service with Twitter via SMS to every nation in a way that is sustainable from a cost perspective. Talks with mobile companies around the world continue. In the meantime, more local numbers for updating via SMS are on the way. We'll keep you posted. Now this has upset a LOT of users (especially in Australia) but is the general outcry from the web community really justified? As Twitter themselves say, it could cost them nearly $1000 per user per year to send txts and with 2.2 million users that ain't cheap. It has always been a mystery to me as to how Twitter makes money and how they are able to send all these txts for free so it comes as no surprise that they have finally stopped doing it. But what about the alternatives? I'm using a mac and an iPhone so I've gone for the obvious choice of Twitteriffic on both which does a pretty good job. On my mac, I get a little chirpy noise and a popup when I get a tweet which works a lot better than an SMS in a lot of ways and this is similar on the iPhone. The only downside is that the iPhone doesn't support 3rd party apps running in the background so at present you have to open the app to see if there are any updates which is a bit of a pain. However, this is due to change with iPhone Firmware 2.1 which is hopefully going to be with us some time in September. Once the ability to receive twitters from Twitteriffic seamlessly occurs, I think it will prove a lot more successful than the txt message route. Firstly, because it will cost nothing to reply (whereas previously it was very easy to reply to a twitter from a txt and thus get charged for it) and secondly because new features can be added to the service. Twitteriffic already supports location awareness on the iPhone so people can see where I am twittering from - a small improvement but an improvement none the less. In response to everybody shouting at Twitter about this issue, why don't they instead complain about the mobile phone companies who are so greedy in the affected countries that they refuse to do a deal with Twitter? It comes as no surprise to me that in the UK the cellular networks refused to budge on pricing but that is no fault of Twitter who have been paying so much over the last year and a half to make a great service at absolutely no cost to the end user (not even adding advertising to tweets which would seem an obvious money making route). So in answer to "is Twitter now dead" I would say no! There are still several uses for it (e.g. I use it to keep a micro blog on my homepage) and with several applications for all types of phones it is still easy to stay updated. It will become really useful for me however when Apple release the next iPhone update with push technology - then it will be as if nothing had even changed. I've installed Kampyle on my site (using a custom icon as their default choices are pretty bad - animated gif anyone?) and I've already had quite a few pieces of feedback. The great thing is that I've been able to fix a few bugs people have alerted me to and then have Kampyle email them back to let them know that the issue has been resolved. Kampyle is pretty good as it is, but the thing that is putting Kampyle on the map is their recent integration with Google Analytics which means you can see all of your feedback stats within your Google Analytics account. The way they have done this is particularly clever - You need to download the Grease Monkey Firefox Extension and install the Kampyle Grease Monkey script, but then when you go to your Google Analytics account you'll see the Kampyle stats showing up in their own dashboard widgets. Pretty clever really. This was a major incentive for me as it means I can now see all of my stats in one place rather than having multiple accounts across the internet. So, if you'd like to leave any feedback on the site just click on the "Leave Feedback" banner in the bottom right hand corner! I've had a few reports from people saying that the latest version of the Stop! Hammertime! firefox extension hasn't been working properly on Windows XP and Windows Vista. A new version will be coming soon but here is a fix for the time being. The problem that people are reporting is that when you go to the preferences section for the extension and try to change the stop button to the custom hammertime button, it won't let you press the "ok" button to proceed with the change. It is currently only affecting Firefox 3 on Windows XP and Windows Vista but I'll be making a patch to fix it shortly. For the time being, if you can't live without a hammertime button (despite the fact the stop button still works and plays the sound), then you can follow the steps below to get it working. First of all, you need to type "about:config" in the address bar of the browser. This allows you access some of the internal preferences and config settings of firefox and all of your installed extensions. You will most likely get a "here be dragons" warning but you can skip this - you do know what you're doing right? You will then need to use the filter option to locate the Stop! Hammertime! preferences. You can do this by typing "hammertime" in the filter box - this should give you one result which by default is set to "false". You need to double click to change it to "true". Once you've done this, simply restart firefox and the new hammertime button will be there for you to enjoy! To change it back to the stop button, simply follow the steps above but make sure the hammertime config entry is set to "false". An update will hopefully be available in the next fews days so that you won't have to perform the above to switch between the two, but this should do for the time being. Alternatively you can buy an Apple Mac or install Linux! In other Stop! Hammertime! news, it seems that the copyright holders for the song "U Can't Touch This" have noticed it's popularity and are attempting to cash in on it. I recently had an email from the Integrated Copyright Group (ICG) informing me that I'd need to purchase a license in order to play the 2 second sound clip in the firefox extension otherwise I would be in breach of copyright. After a few back and forths we came to the conclusion that they could send a "cease and desist" letter from their lawyers but that the extension wasn't being removed (and I wasn't paying for a license). So, we'll see what happens - expect updates on this shortly!! Does anybody really use RSS Feeds? I've been using RSS feeds for several years now and find them incredibly useful for keeping up to date with blogs and news sites. However, today I was talking to another web developer who said that he hates RSS feeds and would much rather have email updates when a site gets updated rather than having to add an RSS feed to his email client. Now I wouldn't find this strange coming from a lot of people as I can understand that a lot of people have no idea about RSS and would get confused trying to work out what an aggregator is. But from a web developer? Come on! If the people that develop websites with RSS can't even be bothered to use it then what chance is there of the general populous using it? I use mac mail to manage all of my RSS feeds and find that it does a fairly good job - everything gets synced over to my iPhone as well so I can keep up to date when I'm on the train etc. I also have a few RSS feeds on my iGoogle homepage so I can see the latest xkcd or dilbert strip whilst I'm pretending to work. Now I'm fairly sure you can set Outlook up to receive RSS feeds - so why doesn't this developer do that? Apparently, if Windows were to crash (unlikely but stay with me on this) then he would lose all of the RSS feeds he was tracking and therefore have to add them again so it's not worth doing. "You could use Google Reader or any other number of online aggregators" say I. "Too much effort" says he. I give up. So, in the next day or so there will be a "sign up" button on this site so that those of you who can't be bothered with RSS can get email alerts when a new message is posted. I've also set up a twitter account which will be syndicating the posts on this site as and when they happen - the account to follow is bendodson_com. Oh, and for those of you that have moved into the 21st century, here is the good old RSS feed.